Ready Made Resources specializes in emergency power supplies and emergency preparedness supplies and has been in business for 15 years. They have a walk in store in the Smoky Mountains that is co-powered by solar and wind as well as their online shop. Seriously helpful folks here. And until November 30th they’re also having a fantastic 25% off sale on their Mountain House freeze dried foods and free shipping on cases–check out their ad on the right sidebar! Now, you all know I love my FoodSaver. It is an amazing machine. 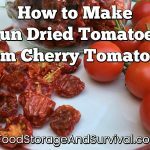 I use it for packing food for the freezer and foods I’ve dehydrated to prolong their useful life. I use it to pack clothes for our Emergency Kits. You should see the compact package it makes when you vacuum pack diapers! I know you all want one or know someone who does. Well, the folks at Ready Made Resources are feeling just that generous and have offered to send one of my readers a FoodSaver GameSaver Deluxe that retails in their store for $149.95. Okay, I’ll admit it. I want it. My 10 year old FoodSaver’s got nothing on this machine. The FoodSaver® Advanced Design series. 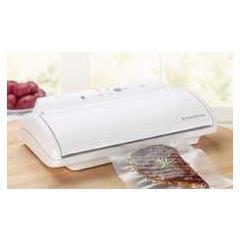 It improves upon favorite FoodSaver features like Hands-free operation — now at the touch of a button. It introduces never-before-seen features like variable speeds for different size bags and canisters, and food-specific settings that ensure a secure seal for dry or moist food. It even has a CrushFree™ Instant Seal feature so that, for the first time ever, you can immediately stop the vacuum process when vacuum packaging delicate foods. And it is Sleeker because it combines function and beautiful form with features like an easy-to-use and easy-to-clean flat Touchpad Control Panels. For your first entry, put your name and email in the form. This is required for entry in the giveaway. If you don’t want to put your real name in the name slot, I guess that’s okay, put whatever you like to be called in that space. The winner will be contacted by email, so put an email you actually check in the email spot. You email won’t go anywhere else. Promise. Thanks for the opportunity! Mine is getting very very old now and a new one would be great! USED A LOT!!!!! THANX! Congrats on an awesome giveaway!!! I need to start doing that form, very handy. We would use this nearly every day. Living in the country with chickens and goats and growing a garden and a hubby who loves to hunt and fish, it would get tons of use. Thanks so much for the chance. Thank you for this generous giveaway!! I love that you have an easy form with all the entry possibilities on it. I've never seen that before, but feel that more blogs should do that. I found you tonight, and your blog, by searching Twitter for #preparedness…I'm so glad I did! I would love to have a new FoodSaver. That form was really easy to fill out. Thanks for the great giveaway!